You ever look at the North Pole and ask yourself, “Why in the Hell would Santa want to live there?” The answer is simple – his operation is so confidential he went to the one place no one could find him. Even if you know exactly where his operation is, good luck braving the elements to get there. I feel bad for the person who has to deliver all those letters to him. Seriously, a man with the power to see us at all times of the day should have an email address. Exploration Age has blank spots on the map beyond The Damned Lands and Verda. The harsh environments of Glacius and the North and South Poles of Canus have kept even the toughest explorers at bay. Just North of Findalay lies a continent about the size of Parian covered in snow and ice. Glacius is one-third frozen ocean, one-third snow-covered plains, and one-third mysterious ice-covered mountain range with the occasional volcano and aberrant ruin thrown-in. The snow plains of Glacius are a near constant blizzard, but thanks to the Society of Seekers and The Explorers’ Guild most of the area has been mapped. For those with the stomach for it, the snow plains offer some of the most spectacular sights in all of Canus. Rare beasts, a strange aberrant ruin full of mysterious labs, and bizarre weather phenomena make Glacius unlike any other place on the planet. All of these rarities are not as strange as the seemingly abandoned tunnels dug into the frozen snow. Where exactly the tunnels lead and what their purpose was is up for debate, as no expedition deep into the tunnels has ever come back. Glacius’ frozen ocean is the most dangerous place to get rich quick. Frozen within the ice is gold dust. Ice-breaking ships manned by all-or-nothing crews make their way through the sea, trying to find the best places to saw out blocks of ice flecked with gold. These blocks are melted aboard the ship and the gold is then harvested. Of course, the frozen ocean has many of its own hazards such as weather, thin ice, hidden icebergs, polar bears, krakens, ice pirates, and more. Boats can get stuck inside the frozen ocean if they venture too far into the ice and the sea freezes their path behind them. In this case the crew can starve and freeze or abandon ship and try to survive out on the ice – a miserable existence. Perhaps the most frightening hazard upon the frozen ocean is The Undead Miner Army. Sailors tell tales of a greedy legion of wights who met their fate mining gold on the ice. These undead are always looking to increase their ranks and horde of gold by attacking the crews of the living. There may be truth to these rumors, since destroyed mining ships have been found with all their gold removed and not a single corpse ever in the bloodstained area. Imagine… a legion of this guy! The Ice Ranges of Glacius are the unmapped area of the continent. The ice-covered mountains have peaks higher than 20,000 feet. As a result, no one has ever ventured beyond the outer-most mountains so what occurs within the Ice Ranges remains a mystery. Occasionally a white dragon can be seen flying toward the mountains and those with keen ears can hear thunderous booms erupting from the inner peaks through the howling blizzard winds. Two active volcanoes live in Glacius. Mt. Steam sits on an island in the frozen ocean. Some sailors claim to have seen a massive red dragon coming from or going to Mt. Steam, but those rumors have never been corroborated. The other volcano, Mt. Hyrias sits on Glacius’ coast and seems to constantly spew ash and lava into the sea. Mad soothsayers claim that the aberrants buried a weapon beneath this lava flow long ago and are soon going to return to use it and cover Canus in ash and fire. If Glacius is remote and dangerous than Canus’ poles are the hardest-earned suicide mission Exploration Age has to offer. Barely explored, and less often survived, few know what the poles have to offer. To some that is a reason to stay away, but for others the challenge has become a draw. The Society of Seekers and The Explorers’ Guild have a bit of an unofficial race going between them. The Society has an independent pet project of exploring the South Pole while The Guild is exploring the North. Both are hoping to prove their superiority over the other by filling in the blank spots of their pole’s map first. While both poles are cold, icy masses of frozen ocean with treacherous terrain and more dangerous weather, each does have its own unique hazards. The North Pole’s winds are stronger than any other on Canus. Whirlwinds of snow and ice can kick up at any moment, or gusts of wind could blow so strong that a traveler without ice cleats may be lifted off of the surface of the frozen ocean and carried into the air. Flying is not an option on the North Pole for any but the most powerful creatures. Below the surface of the North Pole swim predatory creatures known as ice-breaker sharks. These crafty beings use the bony growths upon their heads to weaken the ice in a given area then surprise their prey by either breaking through the weak spot or allowing their target to fall through it before attacking. 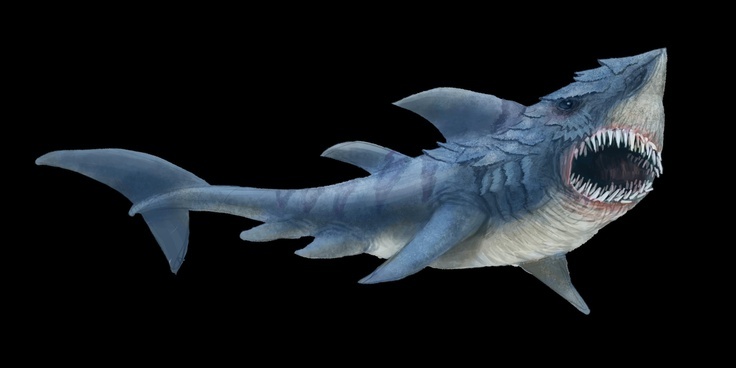 Either way ice breaker sharks can sense footsteps through the ice from up to a mile away and will begin preparing a hunting ground with plenty of these weak spots. They often allow their prey to travel far into the hunting grounds before attacking so they can surround the victims with weak spots, giving no option for easy escape. The South Pole is just as deadly as the North Pole. Winds are not as fierce, however the snow falls so heavily here it forms massive dunes that are treacherous to climb. The snow is uneven and could collapse at any moment, burying a traveler. As if the snow and weather weren’t enough, earthquakes constantly shake The South Pole, threatening to level and reform new snow dunes constantly, not to mention bury and knock adventurers off their feet. But the worst of the worst hazards in The South Pole is The Lingering Havoc. No one is sure of The Havoc’s origin. Some say it is an ancient remnant of aberrant societies, some say it migrated from The Damned Lands or mysterious parts of Verda, and others believe there is a darker force somewhere deep within the South Pole controlling the force. Few have seen The Lingering Havoc and lived to tell of it. Those who have their minds permanently warped. Yet all those who describe The Havoc have a similar story to tell. Either coming out of the snowy depths or rising through the broken ice, a massive creature, more than 500 feet tall by many accounts. The Lingering Havoc is a hulking mass of bones and corpses of various humanoids, animals, and monsters that have somehow formed together into one colossal engine of destruction. Other than their ongoing competition, why would The Society of Seekers and The Explorers’ Guild continue to risk it all over two seemingly worthless hunks of ice? Because there could be profit, adventure, glory, and discovery to be found over the next snow dune. Aberrant ruins that have yet to be picked over, a new race of intelligent beings, portals to other worlds, and more endless possibilities live in the minds of adventurers and PCs. It’s my promise to deliver on those expectations, provided they survive the harsh cold… and the ice breaker sharks… and The Lingering Havoc… you get the idea. If you like what you’re reading, please check out my podcast on The Tome Show, follow me on Twitter, tell your friends about the blog, and/or leave me a comment and let me know you think. Thanks! I’ve already said that I want the world of Exploration Age to be accessible and interconnected enough that a party could experience all or most of Canus in a level 1 – 20 campaign. I also mentioned I wanted countries to be rich enough that a party could never leave one of their borders and complete a level 1 – 20 campaign. To do that means providing some adventure sites which are flexible. Meaning PCs could spend part of a single level interacting with a few of the NPCs and monsters in a given area or they could spend many levels in or returning to that same given area. 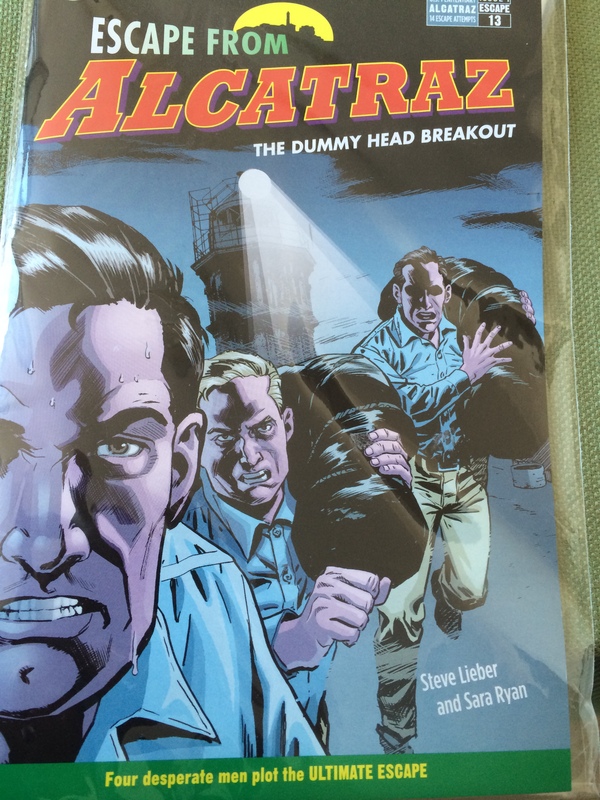 So I have a weakness for prison break stories (and any entertainment involving a shark, but that’s another story….). I bring this up, because I’m going to talk about stealing another idea. This isn’t so much a steal as it is an inspiration. The oft panned Prison Break‘s even more oft panned third season, centers around some of the main characters being thrown into and escaping a Panamanian prison after a few months after escaping an American prison. (I know… I know.) There’s a big difference between the Panamanian prison, Penitenciaría Federal de Sona, and their first penitentiary, Fox River State. In Panama the guards have lost control of the inside of the prison after a violent riot. Now the guards man the walls and merely keep the prisoners contained, and anyone on the inside must fight for survival in a lawless world of criminals. Those in the prison have a life sentence, no matter the crime, thanks to the conditions. So What Am I Stealing Exactly? Essentially, I am taking the concept of Penitenciaría Federal de Sona, a prison with walls run by the guards, but with an inside that is a semi-anarchist city of criminals, and bringing it into Parian. I’ve been further fleshing out the nation and I was trying to think of some landmarks that would be interesting adventure sites beyond the normal ancient ruins and monster lairs. This seemed like a great idea. The adventure possibilities are numerous and unique. I’m taking the concept from Prison Break, but the rest of the story will be all mine! Mine! Ragorn Zhul is a Parian prison in a deep desert wasteland. It sits atop an enormous 3000 foot tall mesa that has sheer cliff sides. The journey out into the desert is usually made by airship. One of the first things a traveler might notice about the adamantine lined walls of Ragorn Zhul are the huge, mounted arrow turrets, made to fire rapidly without having to reload. The second thing one might note are the enormous braziers along the walls and on top of each guard tower, which light up the perimeter like the sun during the harsh desert night. The guards that walk the perimeter of the walls are armed with heavy crossbows or longbows that shoot poisoned ammunition. Each guard is also outfitted with a special explosive lightning projectile to use in case the prisoners try to rise up together (lightning would hurt the inmates, without compromising the integrity of the prison’s structures). Trained giant scorpions carry the guards to the top of the wall and up the side of the mesa each day from the small village that serves as their home. Inside the walls of the prison, chaos reigns supreme. Various gangs protect, punish, and provide for their own, each with their own unique structure. Loners don’t last long, unless they have unique skill or service they can provide while remaining neutral. Even so, the gangs will try to absorb those with any special or magical skill to work exclusively for them. The gangs war for territory and supplies, form alliances, backstab one another, and engage in debauchery. The prison is unisex, so men and women can be found in the walls. Surprisingly, Parian still throws criminals in the prison, particularly, those who need to disappear forever. The empire even takes prisoners from other nations and throws them beyond the gates of Ragorn Zhul – for the right price. How Do It Come to This? Ragorn Zhul wasn’t always this way. It was once the most secure prison in all of Canus. Some of the world’s most dangerous criminals ended up within its walls as well as political dissenters or suspected rebels. In Parian, the Emperor rules and is worshipped as the God of his people. His rule is total and absolute. However, Emperor Quan is, in actuality, just a human. Quan’s brother, Jiang, was appointed Governor of Security. During an inspection of Ragorn Zhul, a plan hatched by some inmates allied with guards led to the capture of Jiang. This plot was masterminded by an ancient elf wizard who was caught planning to assassinate Quan. Mistress Xalian Feyora hates the rule of Quan and would do anything to stop him. Feyora demanded the guards leave and the prison and after freeing the inmates, she and the Emperor are at a standstill. Quan will not give into many of the demands Feyora has, but he also will not storm the prison for fear of his brother being killed. Feyora will not kill Jiang, since the Emperor’s brother is the only bargaining chip she has, and keeps her hostage hidden away, sending proof of life to Quan once a month in exchange for food and supplies delivered to Ragorn Zhul. Feyora wants her freedom and, ultimately, for Quan to step down, but will not kill Jiang to make a point, lest she lose her clout with the Emperor. Quan wants his brother free, but isn’t sure how to accomplish that without risking Jiang’s life. Feyora’s clout makes her an unofficial leader of Ragorn Zhul, but she despises tyrants and thus she lets the gangs run wild. They do respect her however, and they know she keeps the supplies coming into Ragorn Zhul. The gangs are all in agreement – Feyora is to be left alone and given whatever she needs when it is requested. While the gangs run around Ragorn Zhul, and Feyora tries to negotiate with Quan, there are others in Ragorn Zhul who are still under lock and key. Beneath the mesa is a network of tunnels where the worst of the worst and most powerful prisoners are kept. Kept alive by ioun stones that remove their need for food and water, in magically silenced cells that prevent the casting of spells, these prisoners are kept below ground behind many trapped, secret doors. They’re meant to be forgotten. For one reason or another, these men and women were not killed, but needed to be shut away forever. But should they ever be discovered and released… things could become disastrous. Agents of Parian’s government ask the adventurers to do some recon and find the location of Jiang, so that a rescue plan can be hatched. The PCs are part of the above rescue plan. The PCs need information from one of Ragorn Zhul’s inmates – they must get inside and find the individual, earn his or her trust, and get out. The PCs must free someone from Ragorn Zhul. Perhaps one who was falsely placed there? An ancient lich held below in the secret tunnels of Ragorn Zhul has finally had her phylactery uncovered. It seemingly cannot be destroyed. The PCs must enter the prison, find her, find out how to destroy the phylactery, and the end the lich’s life. The PCs get thrown in the prison and must survive. So there you have it. A nice place to visit, an even nicer place to stay. If I can have a few interesting locations like this spread throughout the world, it should make Exploration Age a world where folks will want to keep bringing their characters so they can uncover something new each campaign.